– Most probiotics boast plenty of bacteria, but few make it past your stomach acids to your colon where it’s needed. 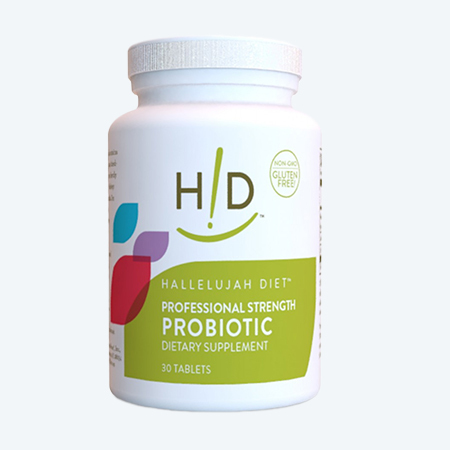 – Hallelujah Diet® Professional Strength Probiotic delivers up to 60% of its bacteria to your colon. No other probiotic can do that. – Just one caplet daily coats your entire GI tract with immune-boosting bacteria to shield you from disease-causing bacteria. – The Hallelujah Diet® Professional Strength Probiotic helps to alleviate bloating, diarrhea, constipation and other digestive discomfort.